Cat Eating Grass - What Does It Mean And Why Do They Do It? You are here: Home / Cat Health / Cat Eating Grass – What Does It Mean And Why Do They Do It? Is your cat eating grass? This behavior isn’t that uncommon, but can have a number of health impacts depending on why exactly your cat is doing so. If you keep catching your cat eating grass, there are a number of reasons it could be occurring. Figuring out exactly why your cat is eating grass can give you clues on their current health, and possibly allow you to stop the behavior if you find it troublesome. 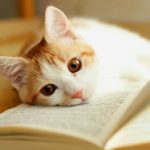 In this articles, we’ll discuss the exact reasons why your cat might be grazing, what the health implications might be, and what, if anything, you should do. Why Do Cats Chew Grass? Cats eat grass for three main reasons. Each of these reasons has different health implications. They also require different actions if you would like the behavior to stop. If you’re asking, “Why does my cat eat grass?” one of these reasons is likely the answer. Let’s explore each of them in turn to get a complete understanding of what your cat eating grass might mean. The first reason a cat eats grass is as a dietary supplement. 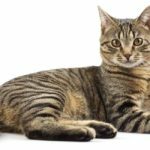 While cats do not have the stomach enzymes necessary to digest grass fully, they do have the enzymes to digest some of the juices in the grass. Some of these juices contain folic acid, which is a vitamin cats must have in their diet to grow correctly. It can also help increase the oxygen levels in your cat’s blood. However, some vets and studies are disagreeing with this theory. Whether this reason stands the test of time, we can’t yet tell. The second reason your cat could be eating grass is for the laxative benefits. Because grass is not digestible by your cat, it acts a lot like fiber and can help them have regular bowel movements. Normally, your cat should not need to rely on grass for this purpose. However, like some humans, some cats have difficulty staying regular and might use grass to help achieve this. Other times, your cat’s digestive system might be clogged by fur, and they might decide to use grass to help push the blockage out. However, there is a difference between the type of grass your cat eats and the effect it has on their digestive system. While broad grasses are thought to have a laxative effect, narrow grasses do something quite different. Since cats do not have the enzymes necessary to digest grass, eating it can make them sick. 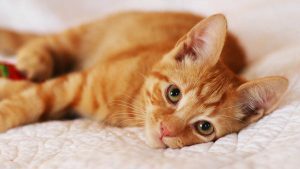 In the process of throwing up, your cat is also expelling other things from their stomach as well, such as parasites, fur, feathers, and even bones. Because outside cats can get into all sorts of things that aren’t necessarily good for them to eat, like rotting animals, grass can help them combat this problem by letting them throw things up when they need to. If your cat vomits after eating grass, it probably isn’t anything to be worried about. Your cat is just throwing up something that made their tummy feel a little icky! 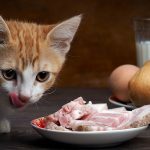 Now that we know why your cat might be eating grass let’s discuss some concerns that pet parents commonly have when it comes to their cat eating grass. Is Grass Good for Cats? Grass isn’t necessarily nutritionally good for cats because they cannot digest it. However, grass does help cats control their digestive system and can be useful to get their system running smoothly again. In other words, grass isn’t good for cats in the traditional manner but can be helpful to their overall health, especially if they have digestive problems. Is It OK for Cats to Eat Grass? If your cat is eating grass, there isn’t anything to worry about. They should be able to regulate their intake and only eat the amount that they need. The only time you should keep your cat from eating grass is if it’s been treated with pesticides or other chemicals. 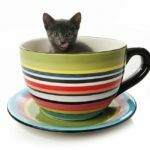 These chemicals can harm your cat if ingested. If the area around your home is regularly treated with any chemicals, we highly suggest keeping your cat inside to prevent them from accidentally ingesting chemicals. Even if your cat doesn’t eat the treated grass, they can still walk through it and ingest the chemicals while cleaning their fur. 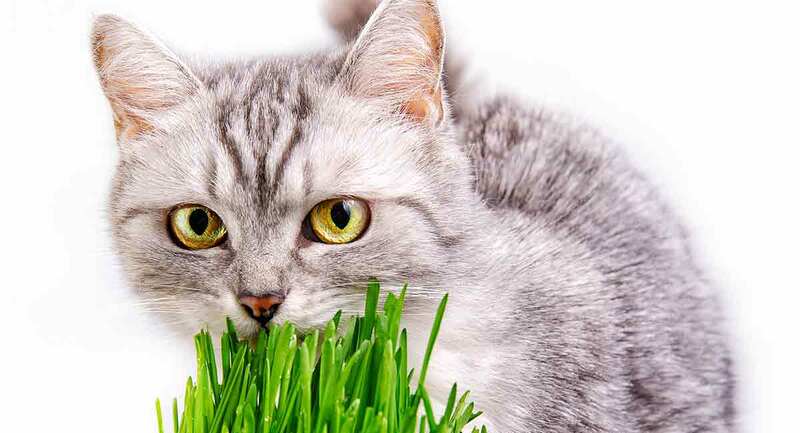 As an alternative, you might want to consider getting your cat some wheatgrass, an alternative to native grasses that can easily be grown indoors for your cat to eat. You can read more about wheatgrass and when you should offer it to your cat by clicking here. Some cats simply eat more grass than others. Scientists are not exactly sure why this is, but one theory is that some cats need more help regulating their digestive system than others. Just like some humans have a more finicky digestive system and have to take supplements to stay regular, some cats have to eat more grass to keep everything running smoothly. However, if your cat is eating a large amount of grass or eating grass on a daily basis, you should call your vet. Cats eat grass for three main reasons, but most of the time, this behavior isn’t harmful and doesn’t need to be stopped. Eating grass is just one way that your feline friend regulates their digestive system and treats their stomach ache! Walters, Sabrina, “Why Do Dogs and Cats Eat Grass?” Patton Veterinary Hospital. 2014. Hart, Benjamin, “Why do dogs and cats eat grass?” FIRSTLINE. 2009. Ueckert, Russel, “Why Do Dogs and Cats Eat Grass?” Big County Veterinary Clinics. 2015. Ward, Ernie, “Why do cats eat grass?” Sunshine Animal Hospital.